Is Dublin Becoming a Serious Challenger to London in Regards to Office Space? 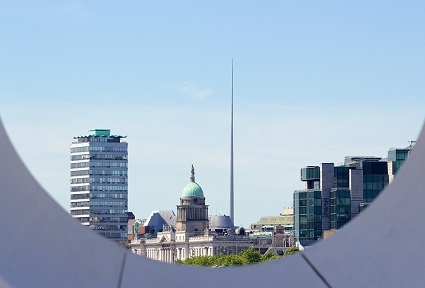 Soon after the EU referendum vote, the Irish capital began making headlines as eyes turned westwards and Dublin emerged as a potential prime destination for companies considering relocating their London offices elsewhere in the EU. In fact, Dublin is already home to some large corporates in many high-value sectors, such as Citibank, Bank of America, JP Morgan, Google, LinkedIn, and Facebook. Many of these companies (and others who are contemplating a possible relocation to Dublin) have chosen to be based here given key benefits like low corporation rates, a transparent and highly competitive tax structure, and flexible labour laws. Moreover, the Irish executive has recently introduced a tax relief scheme available to US investors looking to relocate their offices to Dublin and other Irish cities, and campaigns like TechLife Ireland are positioning the country high up in the global tech scene. Lastly, Dublin is experiencing a commercial construction boom, which will result in over 12 million square feet of new office space added by 2021. In the minds of office occupiers and investors, all these factors converge into one question: Is there any truth to Dublin becoming a serious challenger to London in regards to office space? - There are currently 39 office buildings under construction in Dublin, 33 per cent of which are pre-let, and developers have planning consent for an additional 97 office buildings. London also has a high number of high rises in its development pipeline – 199 to be exact. - Strong demand for office space in Dublin is causing vacancy rates to decline steadily and rental values to increase. Vacancy rates currently average 9 per cent, but are forecast to drop to 7.9 per cent by the end of the year. A similar trend has been observed in London, where availability remains tight. - Demand for flexible and shared office space is on the rise with occupancy levels at 90 per cent. At 900 Euro / workstation, prices in Dublin are already on par with those in London, which is considered the world’s largest co-working market. - The TMT sector is becoming a key driver of growth in both cities. - Dublin has a booming start-up scene with over 1,000 companies providing innovative solutions in sectors like FinTech and SaaS. Although London is home to Europe’s largest start-up scene, Dublin seems to be ahead considering the size of the office market and of the local economy. While it is obvious that the Irish capital is undergoing a far-reaching transformation, the most pressing question is whether Dublin will be able to accommodate the very specific needs of large companies currently based in London. City officials affirm that new office developments will provide space for an additional 100,000 workers and highlight the fact that even if London-based firms decide to relocate, they will most likely do so over a period of several months or even several years, giving Dublin time to prepare. On the other hand, others have claimed that relocation decisions will not only be based on the availability of suitable office space, and wonder if Dublin can compete with other European capitals in terms of accessibility and tax incentives. Potential occupiers may have a long list of requirements that go beyond the availability of space and include the local talent pool, ease of travel to other European financial centres, a preference for common law legal systems, and banking regulations. Overall, Dublin seems well positioned to cater to these requirements, and assuming London is out of the equation, the city remains the only English-speaking financial centre in the EU, which will make the transition smoother for London-based firms looking to relocate. In view of the conflicting opinions, at this point it seems prudent to wait and see whether the Dublin office market is able to exploit its considerable potential and topple London as one of Europe’s leading commercial property markets.